FREE GROUND SHIPPING (lower 48 states only). 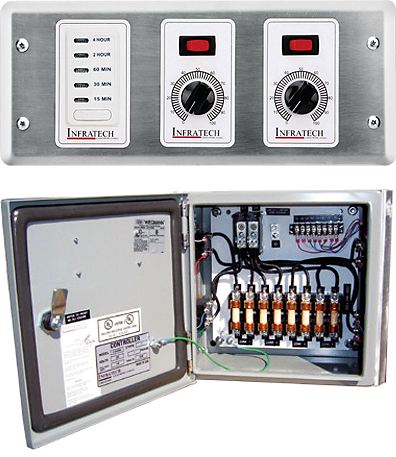 Solid State Infratech Heater Control System is designed for use with multiple heaters. It allows setting up 1 to 4 Multi-Heater zones up to 9000 watts each. Each zone can be controlled with a single, variable output control. An optional, digital timer, with 15 min./30 min./1 hr./2 hr./4 hr. presets, is available to turn the entire system off. The system includes an in-wall control panel (with a gang box and stainless steel wall plate) and a surface mounted relay box that allows the panel to control multiple, powerful heaters. The Relay Box can be located away from the control panel (in a cabinet, closet, etc. ), or built into a wall box with 3" to 4 " of clearance all around. The system can also be incorporated into the most sophisticated EMS and automated home management systems.